Robert Blair is one of the pioneers of the use of UAS for precision agriculture in the U.S. Since 2006, he has been using UAS on his farm in Kendrick, Idaho. He blogs about his experiences at The Unmanned Farmer. Increasing Human Potential recently had the opportunity to talk to Blair about UAS and the future of precision agriculture. You were quoted in a recent Associated Press story on UAS in agriculture. 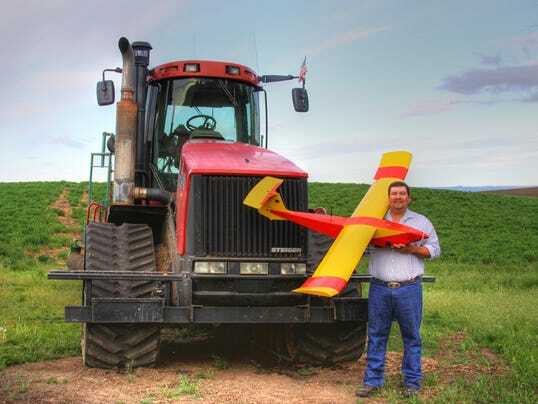 Could you give us specific examples of how you use UAS on your farm? UAS are used to help enhance traditional crop scouting at this time. In order for a farmer to make management decisions, they need to know what the crop is doing. Currently scouting is done by walking or riding a four-wheeler or motorcycle through the field, and just a percentage of the field is seen. UAS allow a farmer to see 100 percent of the field and then identify any anomalies that need to be inspected closer. These anomalies could be fertilizer needs, insect damage, fungus or disease, water needs (if irrigated), weeds, or any other type of area that stands out. By identifying these areas, a farmer can use the GPS coordinates to closely inspect and take samples for testing, such as soil or tissue samples. The scouting information from a UAS is a great way to understand exactly what is going on in a field, because the changes from the ground level might be gradual, but in the air the areas are more easily defined. My personal use of UAS successes has been to use the information to identify wildlife damage in crops. The saying a picture is worth a thousand words is very true with UAS images. Combining the images with yield data from my combine helped to show the size of area and, to some extent, the amount of damage. I have also used UAS for crop insurance purposes, which is similar to animal damage. UAS help in the decision-making process by providing high-resolution, timely data. What are the greatest benefits of using UAS? What advantages do they hold over manned aircraft? UAS offer great flexibility and timeliness to obtain data over satellite and conventional aircraft. Depending upon the type of camera and altitude, we can also have higher resolution images. Clouds and shadows are a factor for obtaining any aerial image. However, UAS are the best option, because they can fly at a lower ceiling below cloud cover. Conventional aircraft have to travel faster to stay airborne under cloud cover and satellite cannot penetrate it. Human safety is also tremendous benefit. There are many remote sensing and monitoring jobs that can be done with UAS, taking humans out of harm’s way. For example, a couple of years ago a team of three were doing monitoring in forest ground with a helicopter, and it crashed, killing all on board. A UAS could have done the same mission, saving lives. In the future, there are other applications that UAS could do as rules, regulations and the technology advance. These future applications could provide cheaper services and/or different levels of service to farmers, ranchers and other industries. How did you initially get interested in using UAS for farming? In 2004, I hired an airplane to do imaging on my farm. This was the first year of running a yield monitor on my combine, and I wanted to do zone nutrient management. Being in that airplane made me realize that high-resolution and timely images were the missing piece in the precision agriculture puzzle. Then, in 2006, I saw an ad in an agriculture publication for a UAS while waiting at the office of my crop consultant. I took the magazine home and immediately called the company. From that phone call, I purchased a unit and went for training. 2007 was a big year in learning the potential uses and markets for UAS. I initially started a business to become a reseller, but after learning about the opportunities I pulled back on that. I had attended several trade shows and had some speaking engagements that also helped me to learn more about this brand new industry waiting to be created. This was also the first crop year that I flew the UAS. The learning curve was more than steep; it seemed inverted. Through the process of flying and conversations, I was able to identify what types of products were needed and how they could be used and integrated with traditional precision agriculture equipment. These initial stages led directly to designing and building of my own UAS to meet the needs of agriculture. And even that has been scrapped due to a better understanding of remote sensing. What types of UAS are you currently using? I have tried several different types of airframes and autopilots. I am currently using an ArduPilot and a hobby airframe in conventional design. I will be using a hexacopter this coming season as well. The costs have come down dramatically since I started, but you also get what you pay for. I am mainly using these to help prove concepts and to identify technology tweaks that need to be made. How do you see precision agriculture changing after the Federal Aviation Administration fully integrates UAS into the national airspace? The use and functionality of agriculture UAS in the national airspace will depend upon what the rules are. I have been trying since the 2008 original Aviation Rulemaking Committee to get agriculture a seat at the table. The considerations of agriculture needs have not been taken seriously by the FAA or the aviation industry. However, there has been a big step made by AUVSI recognizing agriculture as the starting point for commercial UAS use. This was made evident at the 2013 InfoAg Conference in July. AUVSI does recognize the need for agriculture to be at the table; however, it hasn’t trickled over to the aviation industry or the FAA. On the use side of UAS, I see UAS greatly enhancing the decision-making process for agriculture. We are at the tip of the iceberg of a new industry and integrating it into an existing one. Current software will need to incorporate the UAS data. Agriculture will now be able to have data that allow them to be proactive in application of inputs, such as fertilizer, pesticides and water if it’s irrigated land. The biggest benefit will be continuing the process of being more environmentally friendly by placing these inputs … where they are needed. Do you have plans to expand your use of UAS? I do plan to expand my UAS use. My oldest son will be graduating high school this year, and I already have UAS jobs lined up for him. Also, I am working with the University of Idaho to obtain a COA [certificate of authorization] for work-study research. Having two different types of UAS will allow me to play around with some field tests and to help develop proof of concept results that I think will help change how farmers scout their crops. This is an extremely exciting time to be in agriculture. Are there any applications of UAS that you would like to see that aren’t possible with current technology? There are two big issues with UAS technology and companies at this time. The first is that there are startup UAS companies that are touting that their product can do what agriculture needs. However that’s not entirely true. Strapping a GoPro camera on a hobby plane with an autopilot will frustrate users and will potentially give UAS a bad name. This same scenario happened in the early days of precision agriculture when salesmen sold product but didn’t provide support. We need to understand the agriculture market and proceed cautiously while listening to their needs. The second issue is there really isn’t a turnkey system available for agriculture use. I have seen most of the products available and have tested a few. What they claim and what can actually be done are two different things. I am currently working on developing a system that can meet the needs of agriculture. Looking at the future of agriculture UAS, I hope that my research can help provide solutions to today’s and tomorrow’s needs. I can’t say too much due to confidentiality, but the sky is literally the limit. As I have gone through the learning process on precision agriculture, remote sensing and UAS, I know that there are things that haven’t even been talked about yet. As agriculture UAS are integrated into current farming practices, we will discover the gaps that aren’t covered and brand new uses to advance this wonderful technology.